What is the baby’s name? What did Moses’ mommy put him in? God provided a way for Moses’ mommy to still take care of him. Praise God! Verse: Psalm 56:3-4 - When I am afraid, I will trust in you, in God whose Word I praise. Down and over and down some more. That’s the way to make a four! Miss Spider's Tea Party by David Kirk - This book is used again in the curriculum once numbers 1-12 are learned. 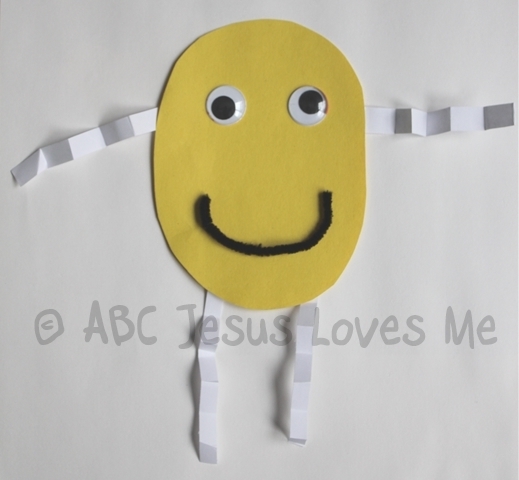 - "Baby in the Basket" Craft: Print the Baby Moses Craft page. Color and cut out each piece. Cut a piece of blue construction paper in half. Glue on the reeds. 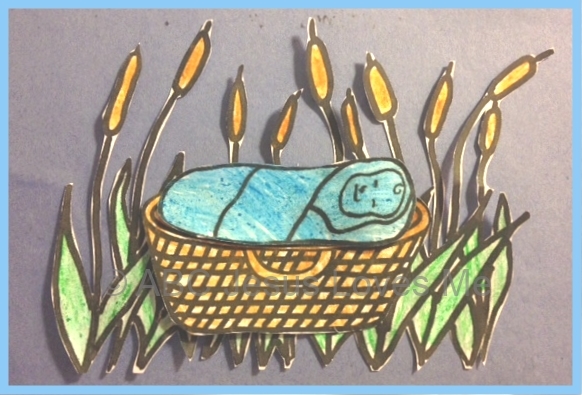 Glue the baby in the basket and glue in front of the reeds. Have the child choose five things in the room to bring to you. Place the items in a small area on the floor and place a small blanket over the items. - Can the objects be seen? - Are the objects still there even though they can't be seen? - How do you know that the objects are still there? Remove the blanket. Tell the child: "This week's memory verse says, 'When I am afraid, I will trust in you.'" Even though we can't see Jesus, we know He is always with us." With the objects gathered, turn this activity into a memory game. Without the child watching, remove one object. Have the child figure out which object is missing. For greater difficulty, remove more than one object or add similar items. - How did Moses' mom feel when she placed Moses in the basket? - How did Moses' sister feel while watching Moses in the basket? - How did Moses' family feel when he was found by Pharaoh's daughter? In teaching this rhyme to my kiddos, I learned that it was hard to memorize all of the characters. So, I created a worksheet to help a child memorize the rhyme. Print, color, and cut out the pieces on the Hey Diddle, Diddle worksheet. Instruct the child to point to each object when mentioned in the rhyme. - Introduce the letters Dd using the tactile letters and decorate the Letter Poster to add to the Letter of the Week book. 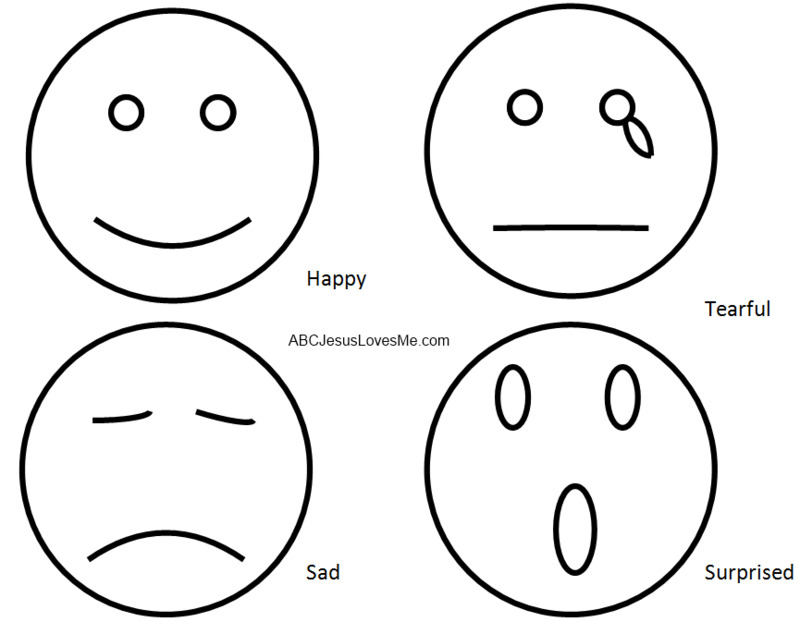 - Write the letter "D" or "d" on 5 index cards. Walk around the house and find items that start with the "d" sound. Tape the cards to the item. For a twist, tape the cards to items and have your child find the cards. - This week fingerpaint to decorate the Number 4 Poster. Add four stickers. Write the child’s name on a piece of paper and have her find matching tactile letters to place underneath each letter. If the child is ready, add additional letters for the child to choose from. 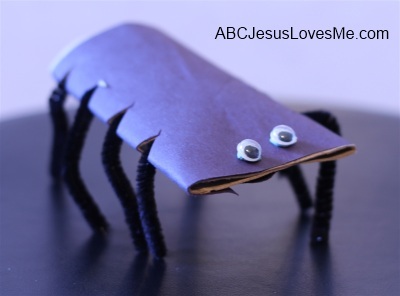 - Create a Toilet Paper Roll Spider. Staple the end of the toilet paper roll together. Wrap the TP roll in black construction paper. Cut four tiny triangles along the sides of the TP roll, directly across from the cuts on the opposite side for the spider's legs. Cut two black pipe cleaners in half. Thread the pipe cleaners through the holes. Add googly eyes. - Discuss how Miss Spider showed kindness to the other insects. - Talk about the fear the other insects had for Miss Spider. They looked at her appearance and not at her heart. 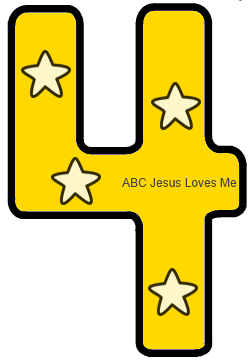 Write various large letters (Aa-Dd) or numbers (0-4) on pieces of paper. Have your child trace over the letter or number with fingerpaint. Using a large ball such as a beach ball, sit on the floor and roll or throw the ball back and forth. Say this week's memory verse while playing.